A bipartisan committee tasked with developing wildfire legislation released an outline Friday afternoon of what their final bill will look like, proposing expanded state oversight of electrical utilities, a streamlined process for clearing dead trees and brush, and a go-ahead to utilities so they can issue bonds to pay for the costs of wildfires caused by their equipment. The proposal also includes a prohibition on utilities using ratepayer dollars to pay for executive compensation or perks. But it's what the conference committee didn't include — a change to liability laws to shield electrical utilities when they start fires — that again dominated discussion. State Sen. Bill Dodd, D-Napa, said a week ago that a controversial push by PG&E and other utilities to change the state's liability laws would not be part of the committee's final product. But supporters of the utilities warned Friday that by sidestepping the liability issue, the Legislature could be setting in motion a process that could lead to PG&E declaring bankruptcy. Scott Wetch, a lobbyist for the International Brotherhood of Electrical Workers, the union that represents PG&E workers, said his group has "grave concerns" about the proposal. He said that if the committee's final legislation doesn't address last year's devastating wildfires — many of which were caused by PG&E — the utility could be downgraded to junk bond status and that could lead to "liquidity issues and put bankruptcy on the table." "Not only will they not be able to do any of the investments you hope to have them make, but it will be a challenge to keep doors open," Wetch said, alluding to the clean energy requirements the state has imposed on utilities in recent years. Wetch added that the proposal won't actually make the electrical grid more reliable and likely to withstand future damage. "It is simply a rearranging of the deck chairs," he said. 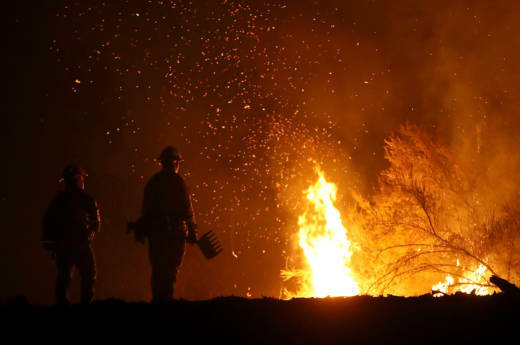 But some ratepayer advocates said the proposal, even without liability changes, amounts to a "bailout" for utilities by allowing them to issue bonds to help pay for increased costs that are the result of wildfires. Michael Boccadoro, lobbyist for the Agricultural Energy Consumers Association, told the committee that his group and others representing ratepayers have two concerns: One, that the committee's proposal will be retroactive and impact all past fires; and two, that it will actually soften state laws so that even when utilities' negligence causes fires, they won't necessarily be held responsible. "Both of these changes have a very, very significant impact that amounts to a massive bailout of PG&E at ratepayer expense," he said. "I know that's not what we are shooting for here, but that's what it amounts to." Other ratepayer advocates, though, including The Utility Reform Network's (TURN) Ignacio Hernandez, said they tentatively support the proposal, assuming that the final language includes "airtight" language to protect utility customers. Lawmakers — both Democrats and Republicans — said they are happy with the balance the proposal strikes. Assemblyman Brian Dahle, R-Redding, whose district was just hit by the deadly Carr Fire, said the proposal will "make sure investors pay their fair share," but also ensure that the utilities are "still solvent and can borrow money at the right rates." But, he added, "there are going to be impacts to ratepayers, there's no way around it." He and other lawmakers promised that they will keep working on the issue next year. The actual bill language will be unveiled next week. Read the committee outline below.